Clear Andean sunshine streams through thin green curtains. The kitten is meowing outside my window like somebody stepped on her, and laughter drifts in from the patio. It’s impossible to refute the fact that it is, indeed, daytime. Another day in my expat dream life. Hell yeah, I thought. That is pretty cool. 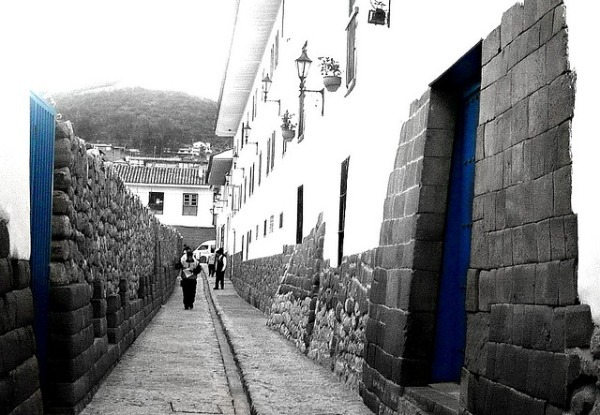 And now I’m home in Cusco and I drag myself out of bed, slip into jeans and tiptoe out of the room. Six more days until my private room is free. Until then I’m sleeping in a shared dorm; I can’t sleep, can’t work, can’t write. Breakfast is a rushed affair – coffee, Vegemite on bread, pineapple juice. I check emails, Facebook and Twitter; review to do lists written on scraps of paper and shoved into pockets. And so passes my morning. I sit in the bar or the office, fending off visitors and questions and complaining staff, longing for a small little space of my own. I try to write, stare at a white page. I try to work, and the phone rings and the dog barks and the girls I’m sharing a room with are awake and sitting down next to me to share last night’s gossip. Lunch is late here; a friend drops by, and I take the opportunity to escape for a while. At least once a week we’ll head to the caldo de gallina joint in Plaza Tupac Amaru for a cheap and delicious Creole feed. I almost always opt for the caldo, squeeze lime and pile spicy ají into the huge, steaming bowl of chicken, noodles, potato and hard-boiled egg. It’s the ultimate reviver; it cures stress, sadness and hangovers. The afternoons are for errands. There’s been more rain lately than there should be this time of year, always in the afternoons. I duck in and out of taxis, never ceasing to feel proud of myself for not even having to negotiate the standard S/.2.50 fare. Tourists pay S/.3, but apparently I have the local air down pat at this stage, despite the obvious gringa looks. I bury my nose in a book to avoid the stock conversation – where are you from? Wow, you speak good Spanish. How long have you lived here then? Have you got a boyfriend? Aah, you must like the Peruvian boys – son muy calientes! Bank, post office, bills, tax office; tick, tick, tick, tick. Then five o’clock rolls round and maybe the rain has stopped and I take the pup, Manu, and wander out of the hostel once again and turn left then right then left again, till the Plaza de Armas opens up in front of me, and every time is like the first time and all of a sudden my expat dream life is exciting and glamorous once again. The plaza is wide and gracious with bright flowers and green grass. The hills of Cusco spread out and up like the smooth green edges of a tinted wine glass, and Cristo Blanco gazes down on me from the lip. We make a wide circuit through the plaza, up to San Blas, then circle back home via San Pedro market. We almost always run into friends, or drop by to visit them at work. The drop-ins, the relaxed work ethic, la hora peruana… these all used to drive me crazy with frustration, but I’m coming to love the fact that here, there’s always time for coffee and a chat. I reach home, and I work a little longer, sip a Campari and orange in the office, start thinking about dinner. Cooking is one thing I miss desperately from home – the altitude and foreign ingredients here don’t agree with my cooking style, and I loathe sharing a kitchen. Besides that, time always seems to be scarce. I reheat the leftover staff lunch or throw together a salad. Then the day is done, and the nights here are for fun. Everybody goes out, all the time. In this respect,it’s a hideously unhealthy city to live in. We end up in Mythology and dance while passing around shared bottles of beer. Someone whirls me around in a rapid salsa I’m just starting to get the hang of. I walk into a yellow-lit Plaza de Armas and grab a taxi for home. Share about a day in your life as an expat. For details, see Matador Abroad’s Call for Submissions. 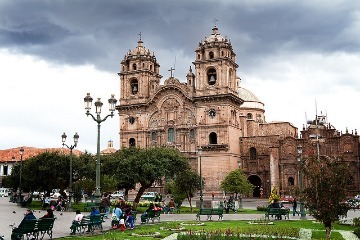 For more about life and travel in Cusco, check out Matador’s Focus Guide on Peru.